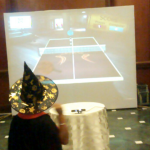 Making kid’s birthday parties a fun-filled success! An easy way to get kids engaged & physically active in a controlled environment. Objective: Giving unique gaming experience at kid’s party. Brief:A 10 year olds birthday is a big deal! 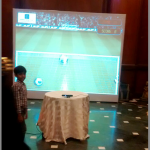 And to match the inexhaustible energy levels of those between the age groups of 8-14 and give them the best fun filled moments of the day, MotionMagixTM Interactive wall is the ideal match for any such birthday parties. 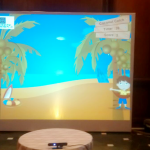 MotionMagixTM Interactive wall for birthday parties is a complete solution offered by TouchMagix and through its partners throughout the world. The entire MotionMagixTM hardware/software bundle along with 5-10 games is available for per day rentals for birthday parties. 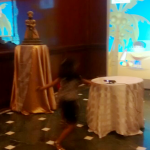 The speed of installation and the total physical fun filled and unique experience it offers kids ensures you can execute the best possible experience for a birthday party. 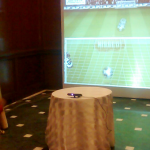 We provided this client of ours with a set of games including Ice Cream Catch game, Car Race, Table Tennis, Balloons, Coconut Catch and Basketball. These are some of the most loved games by the age group between 8-14. And just to show much the kids loved it, we saw total number of kids who played on the 8 X 10 projected interactive wall to be around more than 100 in a brief 2 hour period. 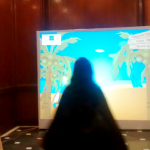 Impact: Kids loved playing games like ice cream catch, car race on interactive wall! 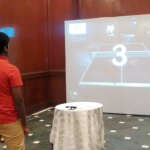 As stated in your blog “The entire MotionMagixTM hardware/software bundle along with 5-10 games is available for per day rentals for birthday parties.” I want to inquire; is this facility available in Baroda-Gujarat. If yes can you share your commercial.